Police in Berlin on Sunday were investigating two separate assaults against young girls believed to have been motived by anti-migrant hatred. An unknown man repeatedly punched two Syrian girls, aged 15 and 16, in the face in Berlin’s eastern Marzahn district late Friday afternoon, before running away. Both girls were briefly treated in hospital for their injuries. According to a police statement, the man allegedly “insulted both girls with anti-foreigner comments” before attacking them. In a second incident in the capital’s Neukoelln area on Friday evening, an unidentified woman allegedly tried to pull the headscarf off a 12-year-old girl, pulling her hair while voicing xenophobic sentiments, Berlin police said. The woman also allegedly threatened the girl with pepper spray “and tried several times to stab her with a syringe that appeared filled with blood,” according to the statement. The woman managed to abscond before police arrived on the scene. Germany has been deeply polarised by Chancellor Angela Merkel‘s 2015 decision to open the country’s borders to those fleeing conflict and persecution at the height of Europe’s migrant crisis. 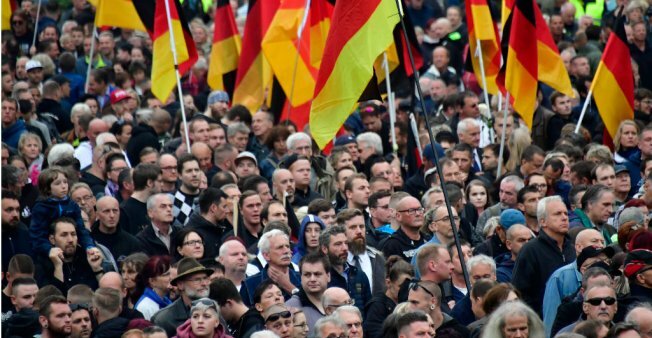 Since then, the influx of over a million asylum seekers — mainly from Syria, Iraq, and Afghanistan — has fuelled the rise of the far-right, anti-Islam AfD party. High-profile crimes involving migrants have sparked angry protests in recent years. A 50-year-old German man was last month charged with attempted murder after he drove his car into groups of foreigners in the cities of Bottrop and Essen. Eight people were injured in the rampage, including a 4-year-old Afghan boy and his mother as well as a 10-year-old Syrian girl. In December, a German court sentenced a far-right activist to jail after he illegally sold guns online from Hungary urging potential buyers to defend themselves against immigrants. Mario Roensch, 35, who was arrested in Budapest in 2016 on a European arrest warrant, received a term of two years and 10 months.